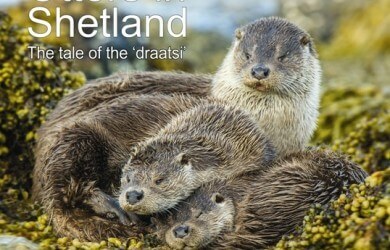 Shetland has one of the highest densities of otters in Europe, and is by far one of the best places to see and photograph otters. Shetland otters predominately live along the coastal edge, fishing in the sea, spending a lot of their time feeding during the day. 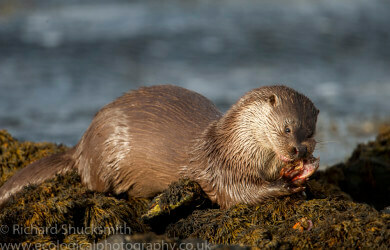 Due to the otters behaviour this makes Shetland a great place to observe otters, it is certainly one of the best places I have lived in Scotland to photograph otters. 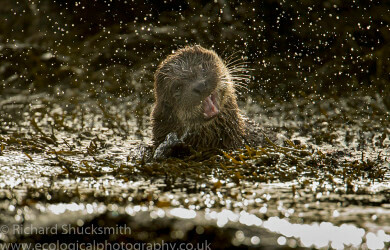 I spend many hours on the coast following and photographing Shetland’s otters, and I have gained intimate knowledge of this charismatic animal and the coastlines where it lives. ‘Otter talk’ is about sharing those experiences, and stories about individual otters and families, and the trial and tribulations the Shetland otter faces living on a wild coast. The orangey glow in the sky was reflecting in the water, giving it a magical look. 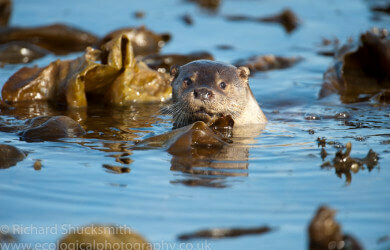 I picked up the otter with my binoculars and I could see he was working the kelp bed towards me. 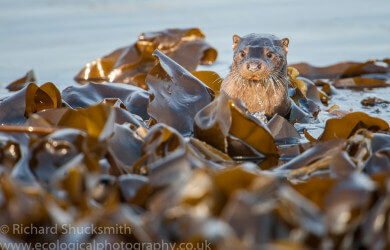 I slowly moved into position below the skyline and watched as the otter got closer. Walking one of my favourite stretches of coast to watch Shetland otters, in particular families, is always a great thrill and often full of surprises. Knowing there is a mother with three cubs and a mum with a single cub on this particular coastline nearly always guarantees sightings. It became apparent, very quickly; it was a female with three cubs. It was a great display for us, over the next three hours, as we followed the family watching them catch fish and play fighting. Setting out to look for a mum and three cubs gave me a rest bite from sitting behind computer writing about otters. 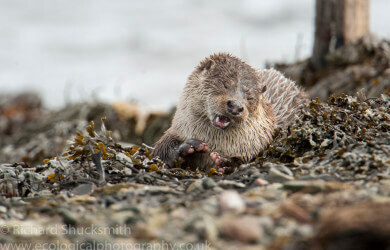 I was not disappointed and found the mum and three cubs already out feeding along the Shetland coast. 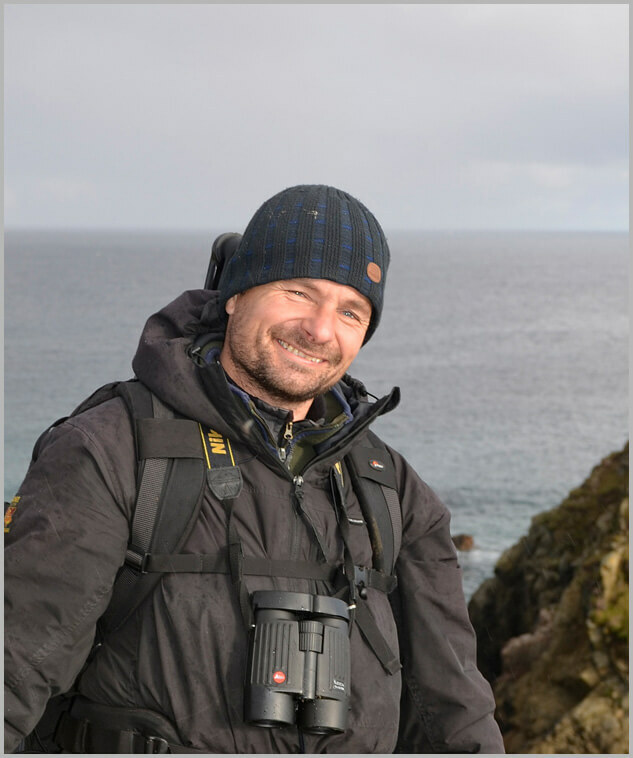 Tracking Shetland wild otters is no mean feat for a cameraman trying to make is mark. Otters he did track and made a great film about Shetland otters. 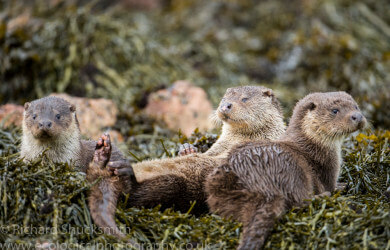 The weather was OK so headed out to check up on a family of Shetland otters and observed some very interesting behaviour. In particular, this family, the mother had three cubs and now she only has one. 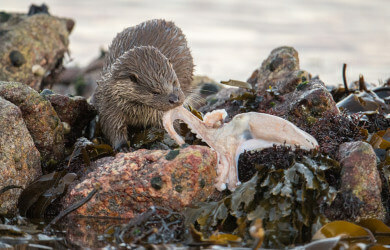 I had been away from home for the last month and could not wait to get out and look for Shetland otters, and see what they were up to. It was a very windy as I headed out the door but I was not disappointed.